Water to Air Heat Exchangers – Industrial Heat Transfer, Inc.
As a more affordable plate heat exchanger option, water to air heat exchangers eliminate costly expenditures that arise from fluid handling in liquid to liquid heat exchangers. Water to air heat exchangers can also function as air to water heat exchangers and some of their many applications include air conditioning, dehumidification, residential heating, process cooling, refrigeration and waste heat recovery. Often used in industrial, commercial and residential industries, water to air heat exchangers are also beneficial for industries such as pharmaceutical, marine, automotive, aerospace, oil and gas, medical, semiconductor, photonics and HVAC. The functions of water to water heat exchangers or water to air heat exchangers are very similar to air cooled chillers and depending on their size can be used in spaces ranging from a single room to 6000 square feet industrial workshops. Typically, water to air heat exchangers are designed in plate, flat plate or plate and frame configurations; these designs are commonly used to transfer heat between liquid and gases. Gases do not transfer heat as easily as liquids; however plate heat exchangers have a larger partition’s surface area than shell and tube heat exchangers which enables plate configurations to offer faster and more efficient heat transference to gases. Most water to air heat exchangers consist of a series of interlocking, thin, corrugated metal plates which are fabricated into a closed structure and use an inlet and an outlet to receive and discharge water and air. Heated water is then forced to flow on one side of a plate while the comparatively cooler air flows on the other side; the large surface area of the plate enables the easy transference of heat between the heated water and air. There are tubes that connect the plates and ensure that the water and air flow never mix while flowing through the heat exchanger. The thermal energy only flows from the hotter to the cooler in an attempt to reach equilibrium at an even temperature. 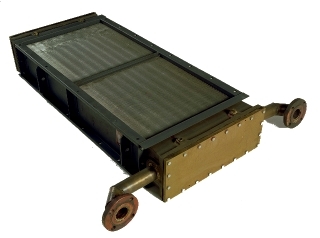 Water to air heat exchangers are largely constructed from materials such as steel, titanium, copper, bronze, stainless steel, aluminum or cast iron. Water to Air Heat Exchangers Water to air heat exchangers are devices used to transfer process heat from water into the air. Water is typically used in liquid to air heat exchangers because it is readily available and has excellent conductive properties; however liquids such as a water-glycol solution, steam, or a refrigerant may also be used. A refrigerant is a compound that undergoes a phase change from a gas to a liquid and back.